Ketoconazole is an effective, broad-spectrum, systemic antifungal agent. 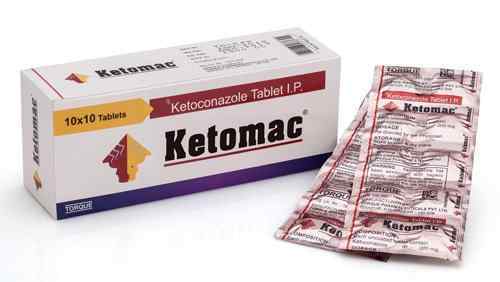 Ketomac tablets containing Ketoconazole 200 mg for oral administration. Ketoconazole blocks the synthesis of ergosterol, a key component of the fungal cell membrane, through the inhibition of cytochrome P-450 dependent enzyme lanosterol 14 Alpha -demethylase responsible for the conversion of lanosterol to ergosterol in the fungal cell membrane. This results in an accumulation of methylated sterol precursors and a depletion of ergosterol within the cell membrane thus weakening the structure and function of the fungal cell membrane. Ketoconazole Tablets should be used when other effective antifungal therapy is not available or tolerated and the potential benefits are considered to potential risks. Ketomac (Ketoconazole) Tablets are indicated for the treatment of systemic fungal infections in patients who have failed or who are intolerant to other therapies: blastomycosis, coccidioidomycosis, histoplasmosis, chromomycosis, and paracoccidioidomycosis. Substrates such as dofetilide, quinidine, cisapride and pimozide is contraindicated with Ketoconazole Tablets. Mild nausea, Vomiting, or Stomach pain; Mild itching or Skin rash; Headache; Dizziness. Store in a cool & dry place. Protect from light.